In which I find myself with more time on my hands, hence the lengthy post. Every other Tuesday morning, my LYS has a thing called “Breakfast Club” where, for $5, you can come in a couple hours before the store opens to knit and enjoy good company, coffee and bagels. It’s sort of become one of the highlights of my, well, fortnight. And it’s pretty much the only time I go to my LYS to sit and knit for a couple (or few) hours and spend time with other knitters (and crocheters). Seeing as how I’m fortunate enough to work from home, I realize I could, hypothetically, go to the LYS like every day of the week and hang out, especially since it’s only a 15 minute bike ride away. But, of course, that wouldn’t be very productive – especially since the yarn store also doubles as a black hole where all time and space becomes distorted. Therefore, what feels like an hour and a half is actually more like… uh, 5. What are you hiding, woman?! As of right now, I am screwing the pattern and just improvising something that I (hope) will work. But I have to say, I am getting dangerously close to loathing this project and wanting to rip it all out and never speak of it again. I should have just spent those 5 hours finishing my husband’s remaining sock. I was so frustrated I had to buy some yarn to soothe myself. I bought some beloved Noro to make a striped scarf. I wanted to use Silk Garden but there were no colors available that I liked. So I went with Kureyon. And instead of colors mixed with dark stripes, I’m going to try a light-striped version. I also picked up these cute and teeny little circs. I had no idea they came in this size! I’m gonna try to knit a sock on them, because double pointed needles get on my nerves sometimes (although they are quite efficient). Anyway, back to the job-limbo. For the past 5 years I have worked for a certain comic book company as the writer and illustrator for one of their monthly books. It has been a most satisfying run, but alas, all good things must come to an end. Last week I completed my final issue. And for the first time in years I find myself without a deadline. I do have other projects lined up but nothing as reliable as that first one, and those are still in early-stages. So right now I’m sort of in project limbo and have a bit more time on my hands until things pick up on my other projects. Part of me is like “woo hoo!” because I suddenly have some time to get some personal projects complete (I’m trying to write a novel), and of course, knitting! But another part of me feels a little adrift and sad at losing such a big part of my regular work routine. Right after I finished my final issue, I felt a little melancholy and decided that I needed both a pick-me-up as well as some kind self-congratulatory prize for my 42 issue run. And what better way to acheive that than with a little retail therapy? 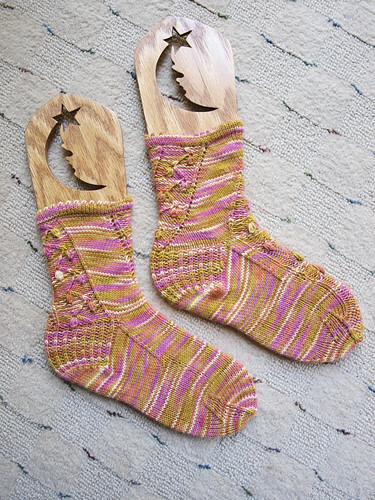 I must be crazy because I have only completed ONE pair of worsted acrylic socks to date. But, when I’m learning something new I ususally like to just dive right into it and tackle it head on. 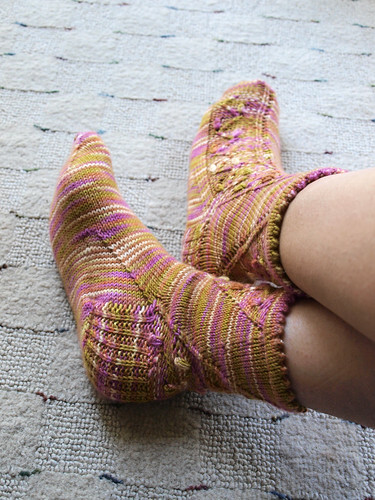 So what better way to learn to knit nice socks than to subscribe to a sock club that will surely have patterns that will drive me insane? Of course, the yarn is main draw to the club. BMA has some of the most gorgeous colorways out there. I ordered two skeins of their yarn back in my early knitting days (when paying more than 5 dollars for yarn was ghastly and risque! ), and I loved and treasured them so much I couldn’t bear to use them. As a result, they have been sitting in a bowl on my coffee table as decoration for the past 3 years! 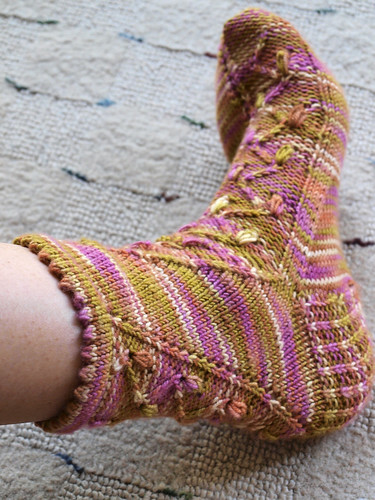 Of course, for my husband’s socks I finally relenquished one of them (Beryl) and used it. 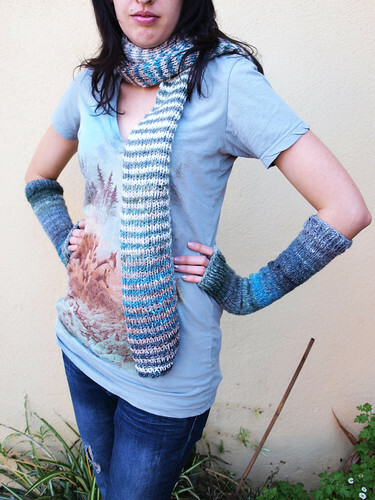 And I love the yarn so much I am totally sold. One last note…. it seems I have been wearing my aforementioned acrylic socks a little too much. (More like slippers than socks, really. I only washed them once, but I swear they don’t smell!). It is a little painful to see a gaping hole in something I spent hours on… but it kinda just makes me love ’em even more.